Ta da!, another vintage scarf refashion project completed! So pleased with my traditional Japanese inspired kimono jacket. Of course, vintage scarves are one of my passions - I love their colours and designs, fascinated by how each one can epitomise a specific vintage era, like a fashion timecapsule. I have a huge stash of them (no surprise there then! ), some in pristine condition - saved for best and never worn? - and some worn and loved with maybe small areas of damage or pinholes on the edges. Today we mainly wear longer scarves, even infinity scarves, so I am always thinking of ways to refashion beautiful scarves from my hoard. I drape and pin them on my mannequin and work out how to cut them so I can stitch them into upcycled garments. 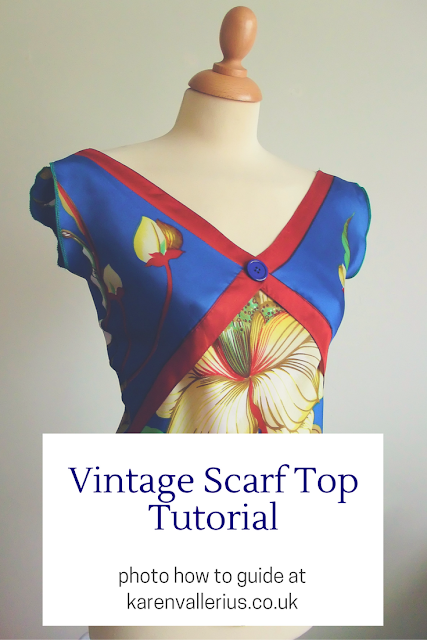 Indeed, one of my most popular blog posts is my Bias Cut Vintage Scarf Top tutorial here. Now, I have made a kimono in the past as part of my entry to a sewing competition. I stitched several scarves together and cut out the neckline from one of them. The sleeves were made from half of a square scarf attached to the main body of the garment. The obi sash had rouleau loops cut from a long bias scarf to wrap round and fasten in front. More on this project here. I changed the design of this kimono jacket by cutting a dropped shoulder line into the front and back pieces rather than simply attaching the sleeves onto the straight scarf edge. I used a beautiful vintage 50s pictorial heavy satin scarf with a still life design of a bowl of richly coloured fruit on the back; I cut the sleeve pieces from two toning long 1970s scarves; and the front was made from a vintage 50s satin paisley scarf. To complete the kimono I finished the front edges and neckline with a satin bias binding in deep blue. I love the way that the different designs and colours complement each other and give an eclectic feel to the kimono jacket. This would be great worn with jeans or shorts to a festival; for the oldies amongst us would also look fab with wide velvet trousers for evening wear. This looks amazing, the different scarf designs go together so well and the loose flowing style is perfect. You are a genius.